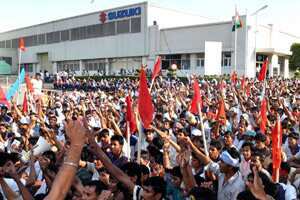 File photo of striking workers outside a Maruti-Suzuki vehicle plant at Manesar, on the outskirts of New Delhi. AFP. New Delhi: Maruti Suzuki India on Wednesday said the number of workers on duty at its Manesar plant has gone up to 600, while talks brokered by the Haryana government between the management and striking employees are on to bring a solution to the 13-day impasse. “Production at the company’s Manesar plant was 200 cars. The number of workers at Manesar also went up to 600 today from 400 yesterday," the company said in a statement. At the Gurgaon plant, the company produced 1,650 vehicles on Wednesday, it added. MSI had to suspend production at Gurgaon plant for two days last week due to non-availability of the components from Suzuki Powertrain India Ltd (SPIL), where workers are also on strike in support of colleagues at MSI. SPIL supplies diesel engines and transmissions to MSI. “In all, Maruti Suzuki manufactured 300 Swift cars today, combined from Gurgaon and Manesar plants," it said. The company said talks resumed this morning between the management and workers in the presence of Haryana labour department officials after it broke down on Tuesday. “Talks between the company management and the striking workers were revived today. These talks are being facilitated by the Haryana government," the company said. Talks are still going on at the time of filing this report.